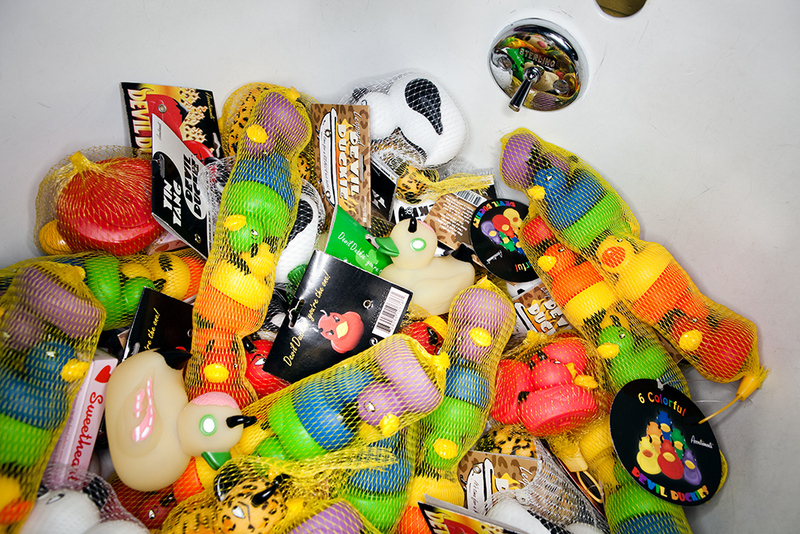 A bathtub full of Devil Duckies at Archie McPhee's Seattle store. Cthulhu water bottles. Bacon-flavored toothpaste. Devil duckies. Fire-spitting wind-up nuns. Band-Aids that look like bacon strips. Bacon-flavored gumballs. A plastic narwhal — complete with a penguin for it to impale. A yodeling plastic pickle. Bacon-flavored mints. And, of course, there’s a bin full of rubber chickens. The company, named after founder Mark Pahlow’s eccentric great uncle, has been shipping strange objects, offbeat toys and slightly off-color gifts from its Seattle headquarters since 1983. Wired visited Archie McPhee‘s retail store, in Seattle’s earnestly funky Wallingford neighborhood. It’s like a warehouse full of carnival toys. If you’ve ever failed to throw a ping-pong ball into the right cup of water and received a strange, almost worthless finger puppet as a consolation prize, you might recognize it in one of the many bins here. Before the internet and eBay, Archie McPhee was a precious source of bizarre gags from around the world. My future parents-in-law got the catalog and cackled while showing me such oddities as a telescoping fork (expands up to 2 feet! ), rubber cockroaches, boxing plastic Godzillas and catapult guns that fling plastic bugs, giving me an early hint of the madness that I would someday marry into. The McPhee catalog strikes a chord with a certain kind of person: children, or those with a particularly goofy sense of humor. If your sense of fun veers between silly and absurd, you’re a likely customer for McPhee’s brand of plastic fantastic humor. Like most great works, Archie McPhee was born out of a desperate need. “Having been born and raised in Ohio, I understand boredom in a profound way,” says Pahlow in his memoir, Who Would Buy This? (available for sale at Archie McPhee for $19.95). To assuage the tedium of his childhood, he went into business, starting by selling illegal firecrackers to his friends. Later, he collected and resold stamps, cigar box labels, old toys and Korean rubber acupuncture figurines. Pahlow bought up strange objects and odd lots on road trips through out-of-the-way Midwestern towns, then sold them at huge markeups to emporia in New York. Eventually he opened his own shop and started publishing a catalog, gradually adding products of his own design to the mix. Now Archie McPhee sells hundreds of original products under its own brand. The “secret,” if you can call it that, is simple. Thanks to the miracle of inexpensive Asian manufacturing, any object, no matter how strange, can be mass-produced in plastic for pennies per unit. Design some ironic packaging, wait for it to get off the boat from China, sell for $8.95 and repeat. What makes it all work is Pahlow’s unique sensibilities: One-third goofy humor, one-third self-aware irony, one-third crass commercialism, all salted with a strange sense of mission. Above: Archie McPhee created the Devil Duckie in 2000, and it quickly went on to become a nationwide cult hit, spawning dozens of variations. $8.95 for a sleeve of six. See the full gallery, with lots of great photos by Jim Merithew: Handerpants, Devil Duckies and Rubber Chickens: Inside Archie McPhee | Gadget Lab | Wired.com.